Bon appetite! Or, as Czechs say, Dobrou chuť! I realize that I had some catching up to do on our cooking adventure. This fragrant stew paired nicely with our Bramboracky, savory Czech potato pancakes. Heat oil in stew pot then add chopped onion. And cook until the onion is golden. 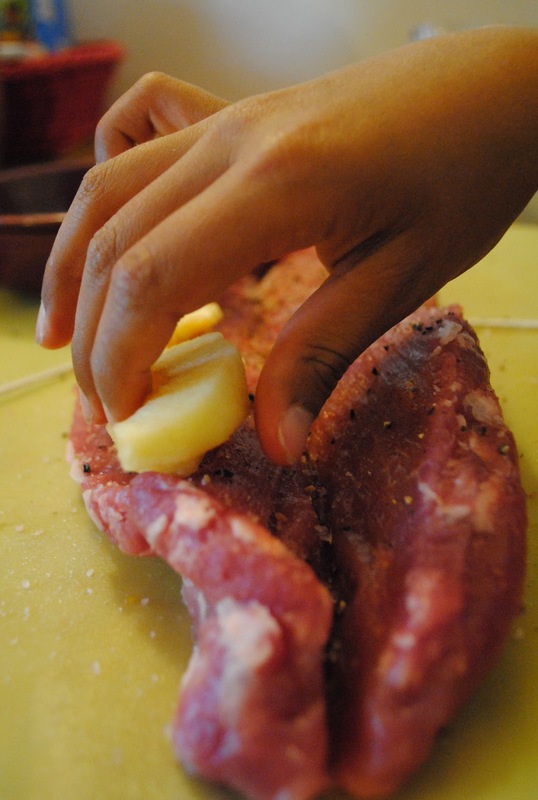 Add cubed meat and sprinkle with salt and pepper. 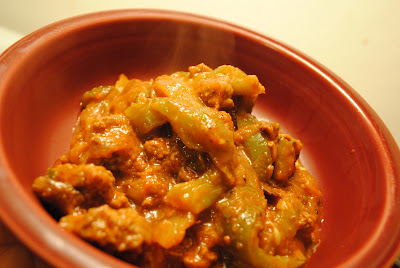 Stir in tomato paste, garlic, vegetables, vinegar, and beer. Mix thoroughly and simmer about 45 minutes or until tender. Add flour to thicken and stir in oregano. 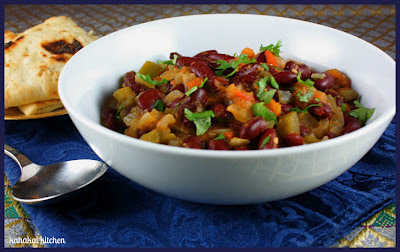 Much like Gallo Pinto in Costa Rica, Habichuelas Guisadas Dominicanas (Domenican Stewed Red Beans) is a table staple in the Domenican Republic, served in almost every household at least once a day. Since gallo pinto is a family favorite, I decided to try the red version. The secret to habichuelas is the sofrito or seasoning - a long-simmered sauce chock-full of garlic, onions, and fresh herbs. Despite the fact that this dish's claim to fame is that it's the best-selling dish at a local food chain - one Domenican blogger wrote: "think the Colonel but with a tropical twist" - I liked the ingredients enough to give it a try. That and the name was just too amusing not to try it. Wa-sa-ka-ka. The boys had a blast with that one. Rub 1 dozen chicken drumsticks with 2 T fresh minced oregano, salt, pepper. Then drizzle them with juice from 1 lime and some olive oil. Roast them in a 300 degree oven until fully-cooked and skin nicely browned. 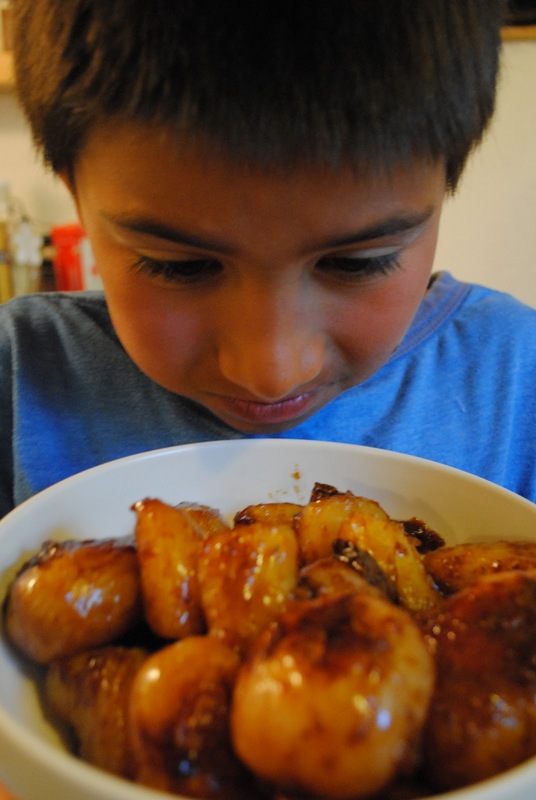 While those roast, make the wasakaka sauce, a thin sauce to keep the chicken moist. For the sauce...place 1 t minced garlic, juice from 1 lime, 1/4 C olive oil, 1/2 C minced parsley, salt and pepper in a saucepan. Bring to a boil. Cook for 5 minutes. Let cool. Serve at room temperature. Here we go. 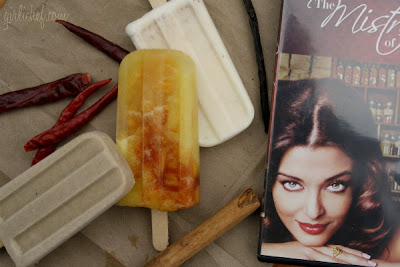 Here are all of the submissions for the June Food'N'Flix event where I selected Mistress of Spices as our inspiration and starting point. 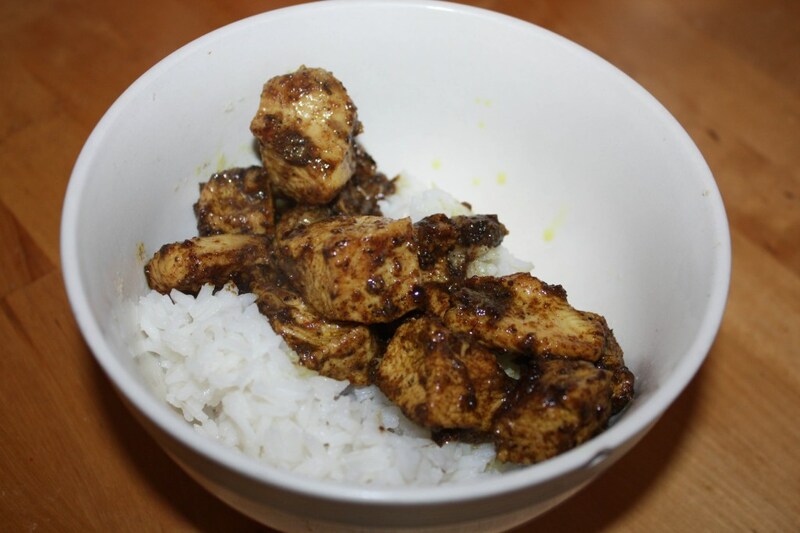 Elizabeth, from The Law Student's Cookbook, whipped up a Black Pepper Chicken that showcases black peppercorns. They used to be known as “black-gold” and were used as a form of money. I love learning tidbits of information such as that and I know that I would love this dish! As for me, I wanted to use turmeric. 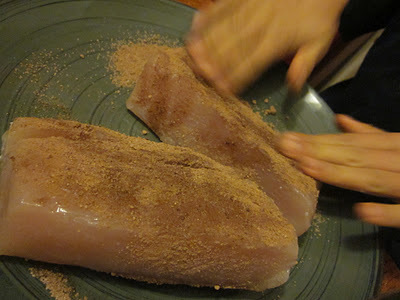 I created a dry rub for fish and served it with a coconut chutney. Turmeric has a warm, bitter taste and is frequently used to flavor or color curry powders, mustards, butters, and cheeses. Fragrant and sweet with a little bit of heat, this was a fun, summer dinner. I might just have to do something with fenugreek on a Tuesday or fennel on a Wednesday! Malice, from Malice in Dunderland, rolled some tofu and blueberry "meat"balls that were seasoned with cinnamon and ginger. The combination of a meaty texture with the sweetness of fruit sounds very intriguing. I might have to give this a go for a red-white-and-blue brunch I'm cooking for my friend's 3-year-old. Thanks for the inspiration, Malice. 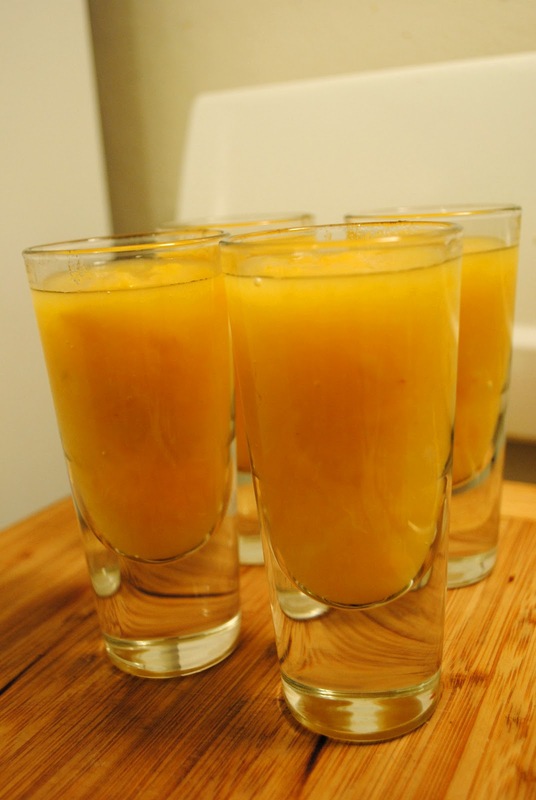 Deb, from Kalahari Kitchen, adapted a recipe from Padma Lakshmi's Easy Exotic. She's come a long way since playing Geeta, a first generation teenager sandwiched between the cultures of her country and the country of her parents and grandparents. Deb, this looks so fragrant. I have put it on my to-cook list. Heather, of girlichef, on whom I really do have a girlicrush, outdid herself - and all of us - with a trio of tropical pops: creamy coconut with vanilla, tangy pineapple with lime and chiles, and roasted banana with cinnamon. Wow, Heather! 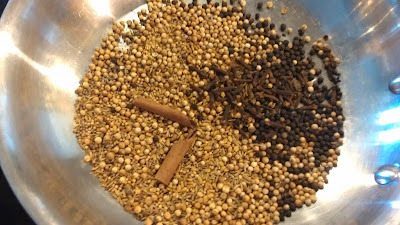 Debra, from Eliot's Eats, browned and ground her own garam masala (a positively amazing spice blend of coriander seeds, cumin seeds, cardamom seeds, brown mustard seends, fenugreek seeds, cloves, cinnamon, and black peppercorn) for a grilled flank steak creation that really had me wanting to stick a fork into my monitor. 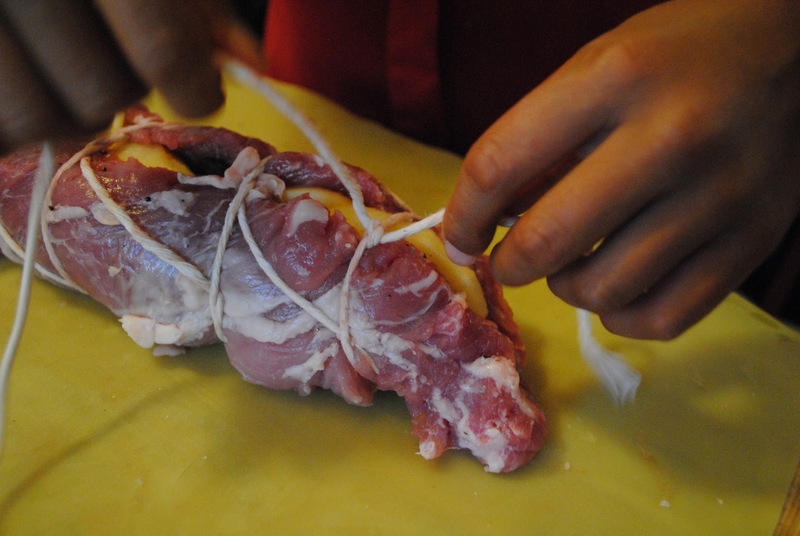 Glennis, of Can't Believe We Ate, sent in her Mistress of Spices Inspired Breast of Chicken in the final hour. And I am so glad that she did. Since she forgot to take photos, I might just have to cook this up to see it for myself. But, even sight unseen, it sounds delicious! 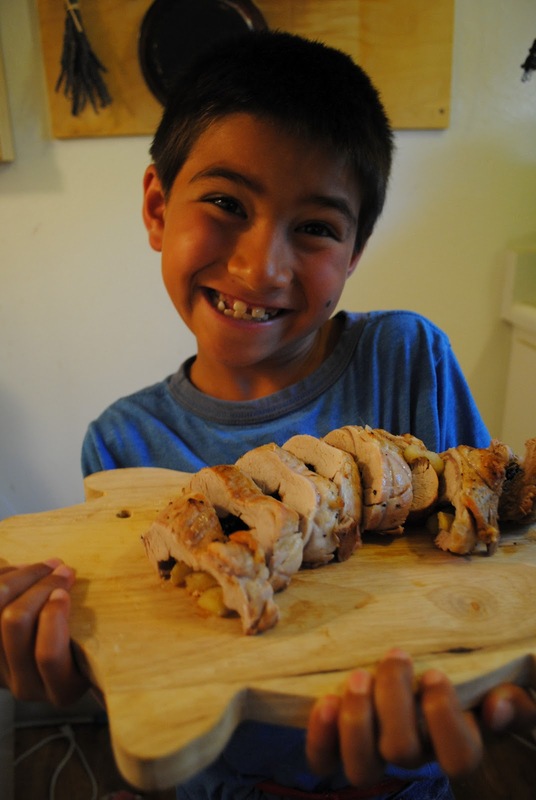 Very grateful to all who participated in my Food'N'Flix event. You are all mistresses of spice in my book. P.S. If you'd like to join the fun for next month, we're watching - and cooking - Because I Said So. Heather at girlichef is hosting. The final two countries in our Cooking Around the World adventure for the letter 'D' are Dominica and the Domenican Republic. Yes, those are two different countries. I had to look that up myself. I'm pretty sure that I, ignorantly, have used those names interchangeably. Whoops. But you can see from the map, above, that Domenica lies in the archipelago that begins with Anguilla in the north and ends with Trinidad and Tobago in the south while the Domenican Republic is further west, closer to Jamaica and Cuba. So, first we're traveling to Domenica. Dominica was the last of the Caribbean islands to be colonized by Europeans due primarily to the fierce resistance of the native Caribs, finally falling under French control. 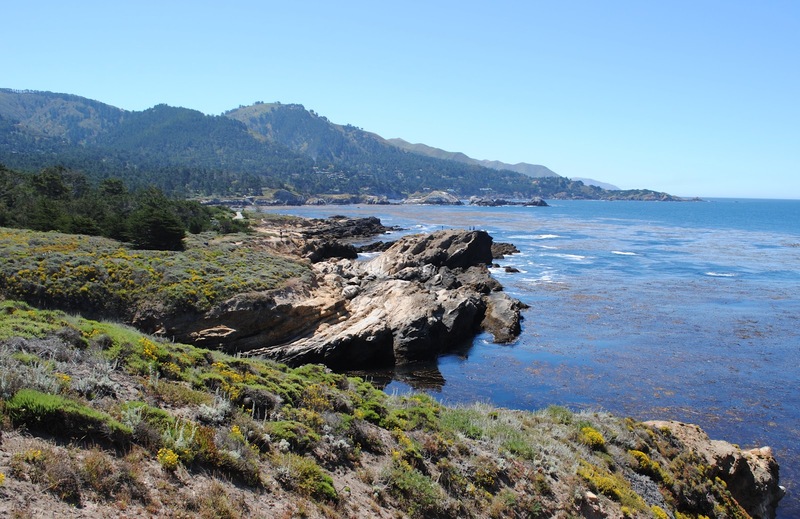 France ceded possession to Great Britain in 1763 who, then, made the island a colony in 1805. Finally Domenica gained its independence in 1978. Reading about the Domenican cuisine, they seem to have access to a variety of fruits and vegetables, including watermelon, pineapple, mango, citrus, coconut, banana, sugar cane, sorrel, paw paw, tamarind, guava, carambola, soursop, gooseberry, barbadine and passion fruit. Being a tiny Caribbean island, seafood also abounds with blue marlin, dolphinfish, grouper, kingfish, snapper and lobster in abundance. And two favorite local delicacies are: mountain chicken, one of the largest frogs in the world which is only found on Domenica, and manicou, the common opossum which is often curried or just roasted. And glancing at those recipes is when I realize that I'm not quite as adventurous as I would like to think I am...not that I would have access to those ingredients, even if I wanted to cook opossum tonight. I stuck with some less off-the-wall recipes for tonight's dinner. Tannia is, apparently, a generic Domenican term for a number of food, including yams, cassava, breadfruit, and plantains. What do all of those have in common? Starch?!? Well, I happened to have two big white yams in my fridge and frozen breadfruit in my freezer. Perfect! Peel and cube the tannia. Boil in salted water, just covering the tannia, until soft and mashable. Do not drain; you will use the cooking liquid. 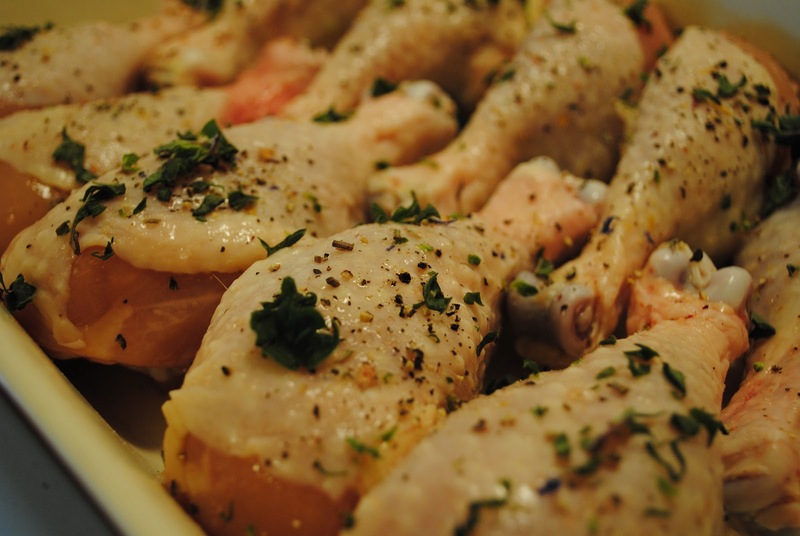 Place two tablespoons of butter in a pan and cook the chopped onion and herbs till lightly brown. Make a roux. 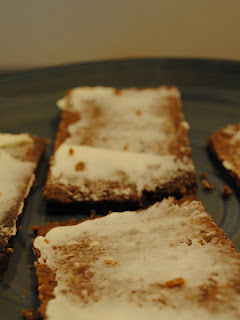 Then blend in hot milk to make a creamy base. 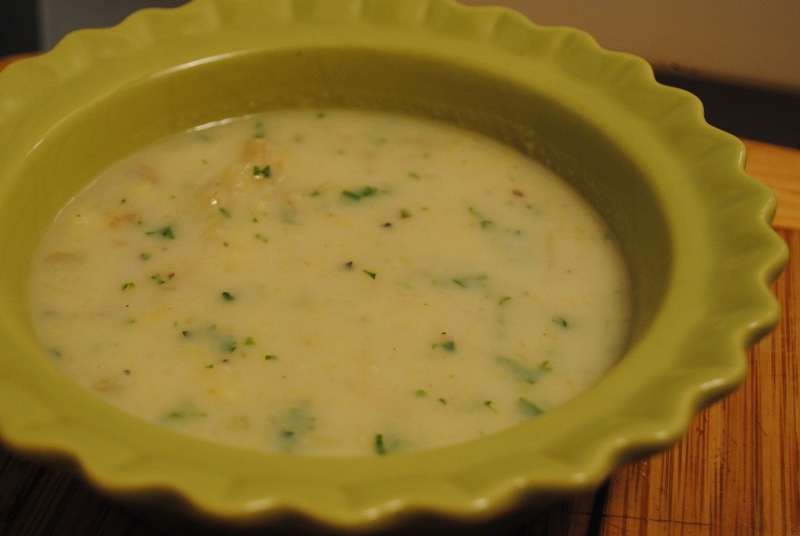 Mash the tannia in its cooking water, then combine mixtures - the cream sauce, the tannia, and the browned onion-herbs. Season with salt and pepper to taste. Reheat the mixture and serve with some freshly chopped herbs sprinkled on top and some warm rolls. Dylan put his, now, considerable bread-making skills to work tonight, making a Domenican leavened coconut bread. It turned out pillowy soft with just a bite of the coconut. Lightly flour the work surface, and knead dough for 5 minutes. 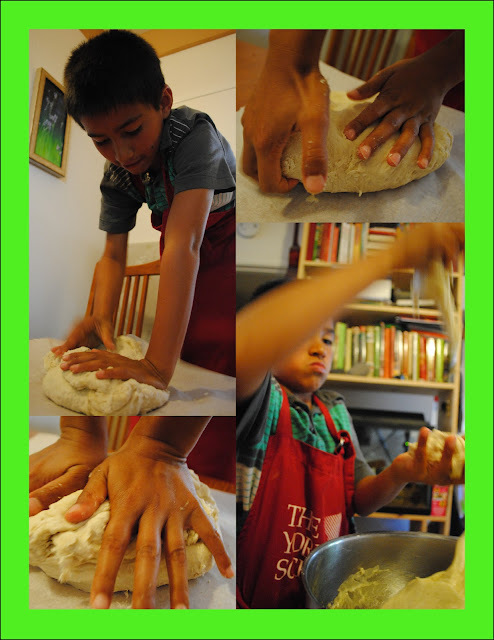 Add the coconut and knead for another 5 minutes until it is smooth and elastic, then place in a greased bowl. Place the bowl in a warm place for 40 minutes until it has doubled in size. 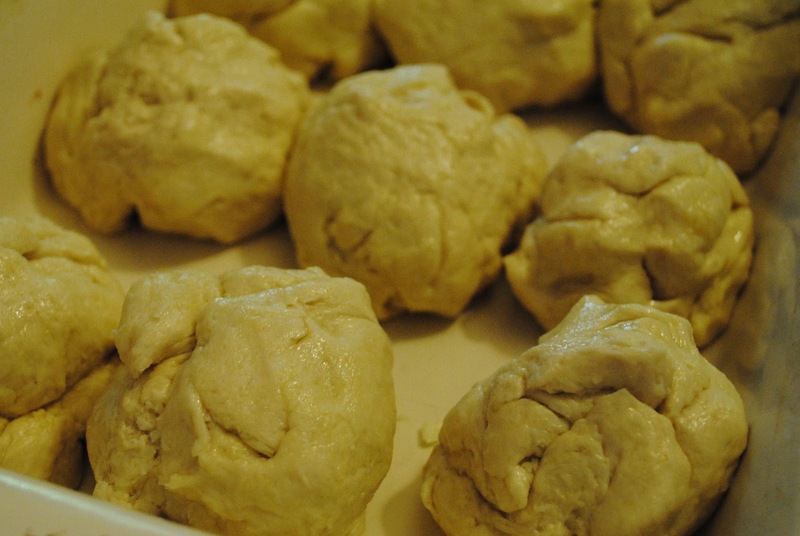 Preheat oven to 400 degrees F. Roll dough into fist-sized balls and place in a greased baking dish. Sprinkle with more salt then let rise for another 20 minutes or, again, until the dough has doubled in size. Tomorrow we head to the Domenican Republic before attacking the 'E' countries on the list! From Denmark, we traveled by tabletop to the tiny African nation of Djibouti, pronounced dja-booty. And, yes, my boys were giggling and dancing around the dining room, singing: "Shake dja-booty! Shake dja-booty!" Facing the narrowest point of the Persian Gulf, Djibouti lies in a strategic position and was, therefore, used as a landing point for trade vessels for many centuries. As a result, in addition to its native cuisine which is very similar to its neighbor Ethiopia, Djiboutienne cuisine had strong Arabic, Indian and British influences. The Portugese also brought the techniques of roasting and marinating foods to this country; Arabs introduced saffron, cinnamon, pomegranate juice and other spices to the country as well as various citrus, bell peppers, chiles, tomatoes and maize. I had some past-their-prime bananas and thought that Djiboutienne banana fritters would make a fantastic breakfast...along with some maize pudding. They did. We especially liked the nutmeg! Mash bananas with a fork, or potato masher, to make a pulp. Add the flour, sugar-water, and nutmeg. Add more water, if needed, to make batter into a cake consistency. Mix well and fry in a greased pan until golden brown. Dylan asked why foods in Africa were mushy. 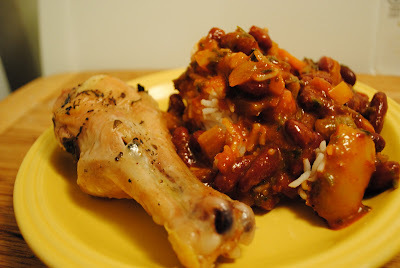 He remembered eating at an Ethiopia restaurant in Berkeley where everything was mushy. And we have cooked other mushes through this adventure. 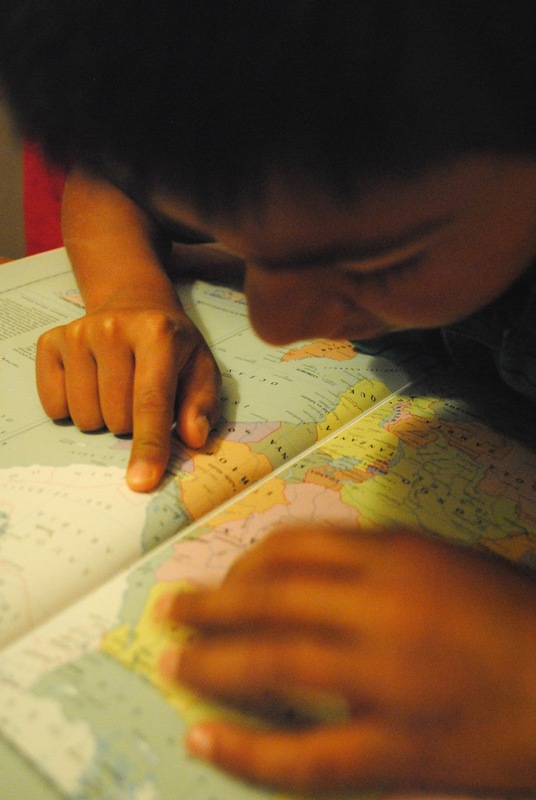 Riley didn't skip a beat, quipping, "Maybe they don't have toothpaste and dentists in Djibouti." Dylan just nodded, chewing on his fritter. And that's a wrap. 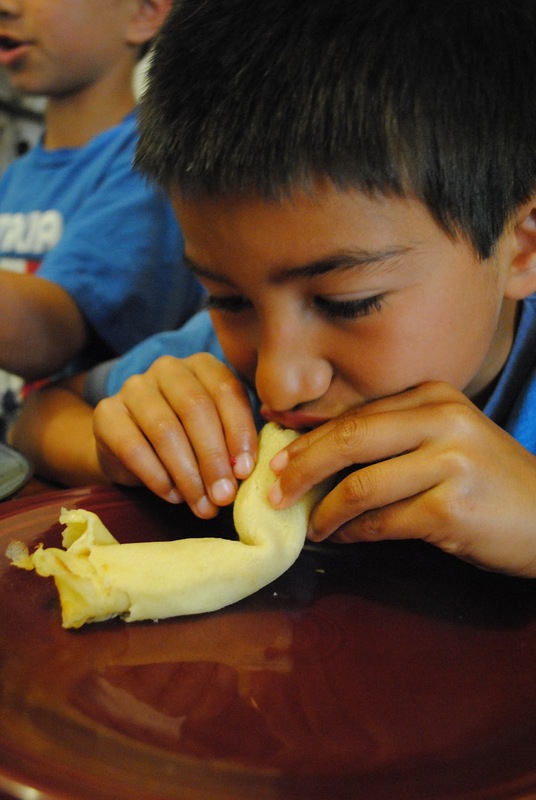 I told the boys we were doing a series of Danish dishes in honor of our favorite Danes - Rikke, Ulla, Danya, and Stella - during our cooking around the world adventure. So after three dinners and a breakfast, I think they're ready to move on to our next country. These delicate pancakes are scented with cardamom and I received the best compliment ever when I made them: "Mom, these taste just like Danya and Ms. Ulla's!" That is high praise from my 10-year-old. 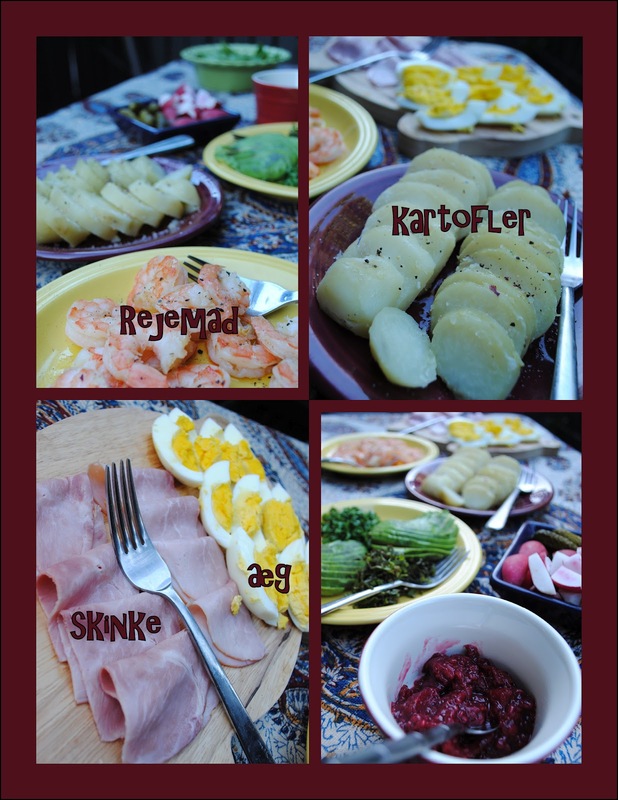 Though this is traditionally a mid-day meal for the Danes, we ate them for dinner, outside on a warm summer's evening...and loved them! I had initially thought to pre-make the smørrebrød, then I realized it would be more fun to unleash the boys' creative palates. 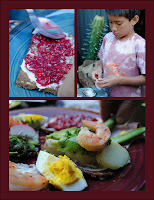 So they slathered rhubarb-raspberry jam on top of the buttered rye breads, topped them with potatoes, ham, hardboiled eggs, shrimp, avocados and more. Delicious! Dylan was my kitchen elf on this one and did a great job, from stuffing and lacing the pork tenderloin to gently shaking the pan to get the caramel all over the potatoes, I think he would have made his Zia Rikke proud. 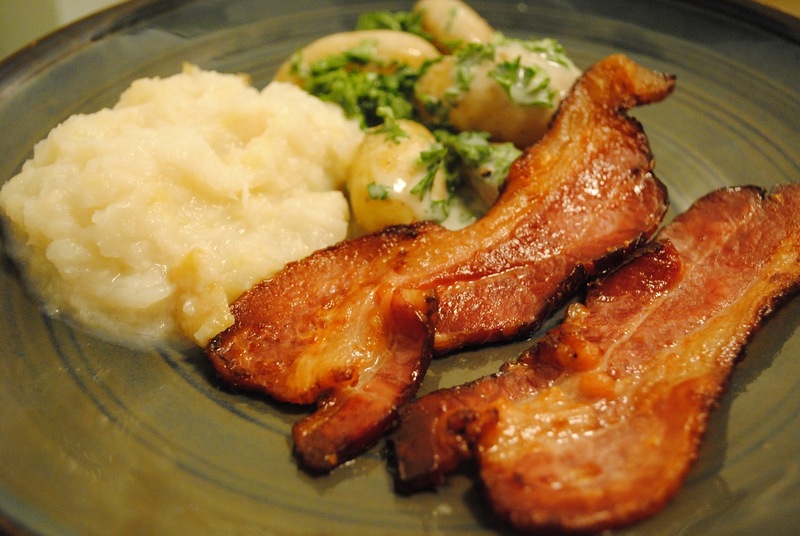 What I didn't realize was that, though I saw a translation of this dish as "roasted bacon" it's traditionally an unsmoked bacon. Maybe cuts of pork belly. I'm not sure. I had applewood smoked bacon in my fridge, so that's what I use. 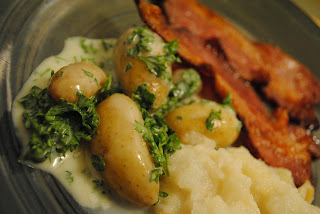 I served it with fingerling potatoes in a creamy parsley sauce along with mashed turnips. 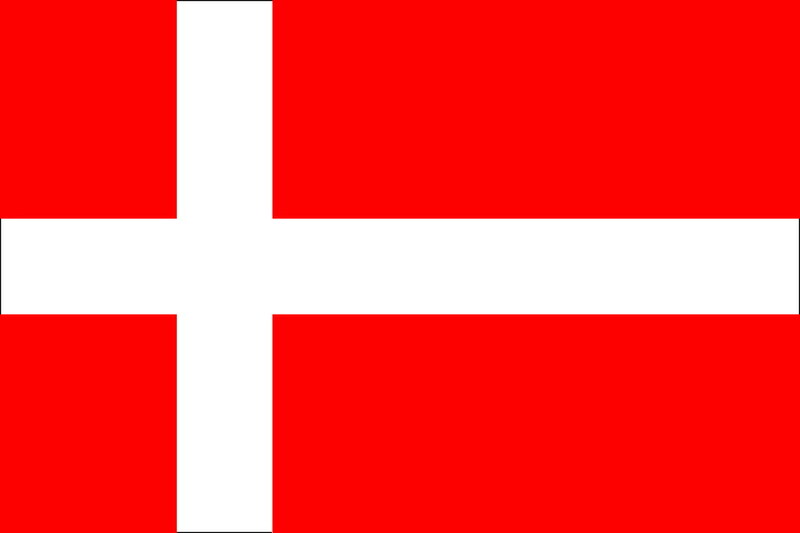 I hope you enjoyed our Danish series. We're off to Africa next! I had initially thought to pre-make the smørrebrød, then I realized it would be more fun to unleash the boys' creative palates. And, this concludes our Danish Cooking Around the World Adventure. We're off to Djibouti next. Meat and potatoes. Meat and potatoes. Meat and potatoes. 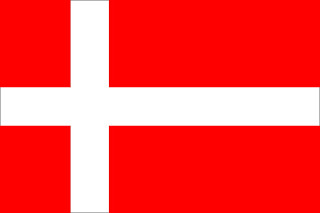 For a country where no one lives more than 30 miles from the coast, Danes sure do like their meat! My boys are very happy this week. Tonight I made Stegt Flæsk Med Persillesov, roasted pork with parsley sauce. What I didn't realize was that, though I saw a translation of this dish as "roasted bacon" it's traditionally an unsmoked bacon. Maybe cuts of pork belly. I'm not sure. I had applewood smoked bacon in my fridge, so that's what I used. Preheat the oven to 400 degrees. Lay the bacon flat in a baking dish. Roast for 20 minutes. Flip. And roast for another 20 minutes. The fat should be rendered and the meat crisp and browned. Let drain on a paper towel to absorb the excess fat. Boil your potatoes until cooked. And make the parsley sauce. I had in my head a fresh, herb-heavy sauce, more like an Argentinian chimmichurri, but the Danish parsley sauce, persillesov, is essentially a cream sauce with chopped parsley. It was a nice accompaniment to the potatoes and perfect flavor-foil to the salty bacon. 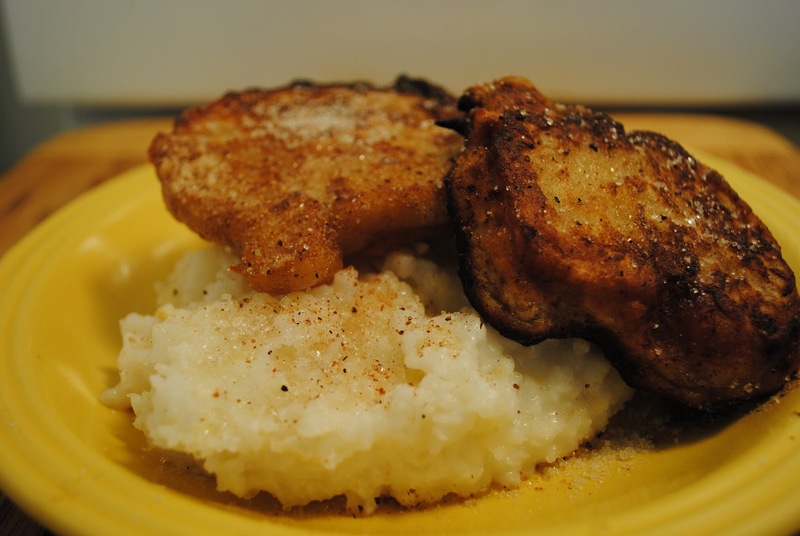 I also served mashed turnips - three roasted turnips and one roasted apple mashed together with a pat of butter and a splash of milk. Abrikossuppe (Apricot Soup). This was a must for our second Danish feast because I was intrigued by a fruit soup and because I had a bunch of angelcots - white apricots - in our fruit bowl. But I had no idea if this was, in fact, served as a starter or a dessert. I opted for the latter, serving it with strong cup of coffee. 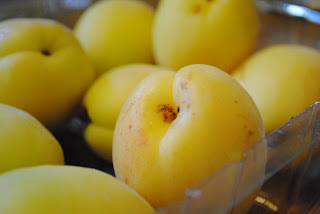 The recipes I found utilized dried apricots; mine were fresh. Also, the recipe I found didn't have any proportions, so I made it up as I went along. Hopefully this is close to an authentic Abrikossuppe. Place all of the ingredients, except for the starch, in a pot. Bring it to a boil, reduce the heat, and simmer until the apricots are soft enough to mash. For a smooth soup, run the mixture through a sieve; we opted for a chunky version, mashing the apricots with a hand potato masher. Whisk in the starch and cook until it's the consistency you want. I have to say that I wanted to like this place. I really, really did. I could never be a vegetarian again because I love meat. Sorry, Veg-friends. It's true. I was a vegetarian for the better part of a decade. 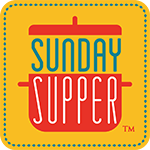 And though we eat a lot of fresh vegetables and have plenty of vegetarian meals, lamb lollipops, roasted pork tenderloin, and tasty burgers top our favorites list! After a fantastic morning in Point Lobos, I told the boys we were going to try out a new burger place. "Great!" they cried in unison. 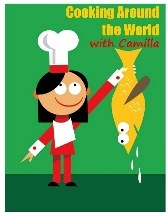 They are always keen for a culinary adventure. New places, new foods. They love it. I usually make a concerted effort not to be negative and to give people and places a fair shot - at least once. But, seriously, within two minutes of walking into this restaurant, I wanted to leave. However, the boys had their hearts set on trying it, so I stuck it out. Needless to say, we won't be back. That's one of the great things about living where we do: countless dinner options. I once read that even if everyone on the peninsula went out to dinner at the same time, three-quarters of the seats would still be available. I believe it. So, say what you want about new spots needing to work out the kinks, but 400 Degrees was definitely a one-timer for our family. We won't be back. Did I already mention that? Their ordering system is completely ridiculous and confusing. There is a large counter with a sign above it that reads: Order Here. I placed the order, received a table number, and a quick brush-off of "you pay at the table." Okay. So these gadgety things are sitting on the table with some kind of interface to the computers at the counter. I muddled through entering my table number and paying for my order. Then I realized that I forgot to order the milkshakes and tried to add them. It took three - no joke! - employees pushing buttons on the gadget, taking the gadget to the counter to re-sync it or something, and coming back with the gadget for me to finalize the order. Really?!? I would much prefer to walk up to the counter, place my order, and pay a real person. I am not a fan of gadgets just for gadgets' sake. So I mentioned the table-gadget. It is supposed to be a tool to help with ordering and paying, but it also has games on it which my 8 and 10-year-olds discovered within a millisecond of picking it up. We don't have many games and gadgets at home. And what we do have is certainly not allowed at the dinner table. When we sit down to eat, we make eye-contact, we have conversations, and we enjoy each other's company. But, what the heck, we're trying something new. But, only two games are free. After that, you might unwittingly be paying $2 for your kids to ignore you. Not cool. Second, there are two large televisions mounted on the walls at either end of the restaurant. So, no matter where you look, your eyes fall on them. I guess that's the point. But, we don't watch television when we eat and I didn't think we were going to a sports bar. Third, even though you are pretty much forced to watch the television, you can't hear it because they are muted. But your ears are assailed with loud music. Remember what I said? We like to talk when we eat. It was almost impossible to do that with all of the distractions. 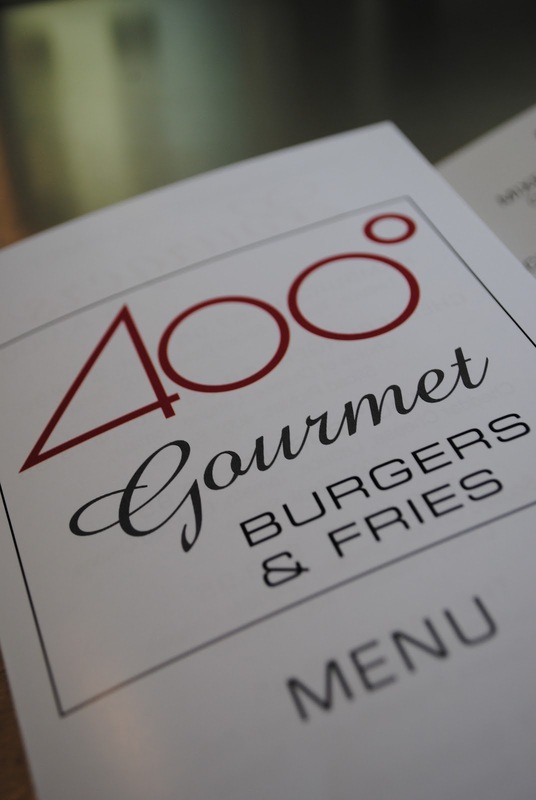 400 Degrees is over-priced. I know it's Carmel. But it's still a burger joint. Two kids meals (hamburgers, fries, and milk), two adult burgers, and two milkshakes ran us sixty dollars, including a moderate tip. Sixty dollars for lunch. For burgers. Unreal. I would vastly have prefered to go to one of our favorite sushi places where we feast - sashimi, gyoza, sushi, inari, chicken teriyaki, seaweed salad, and more - for much less than that. So, if the goal-audience is teenagers, don't you think it would be more geared to teenager budgets? What we ordered didn't come with what it said. Jake ordered their Jack Burger - local jack cheese, roasted chili pepper, picked onions, avocado. It didn't have any avocado. Perhaps it was an oversight, maybe they didn't have any avocados. But when you only have four things listed as part of a dish, taking one thing out - for whatever reason - is pretty sad. The buns. 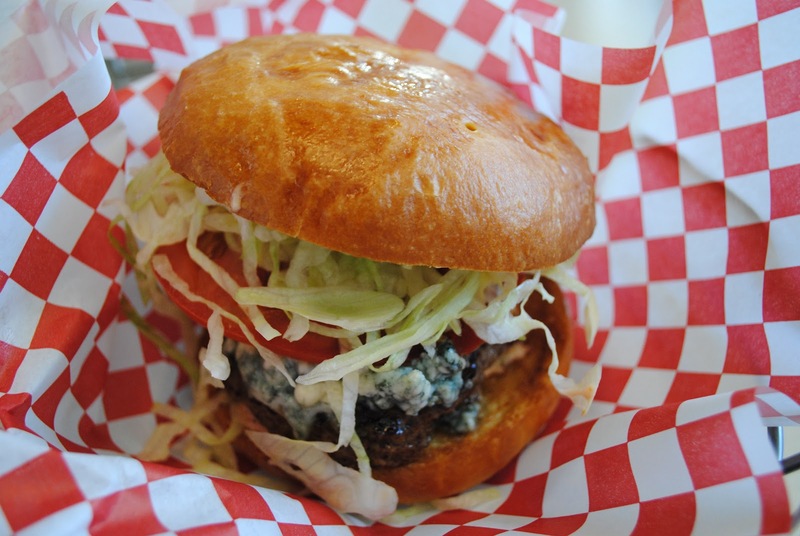 Their brioche buns were a surprising addition to a burger. The buns were fluffy and pretty. And tasty, too. I never thought to serve a burger on brioche. I normally think lemon curd or something like that. 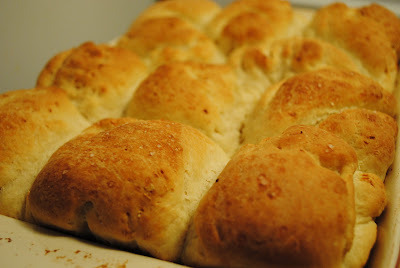 So, using a brioche in a savory setting was a pleasant surprise, and one I'll mimic at some point. The burgers. Not surprisingly, their burgers are good. Plain jane, but good. We ordered two of the kids hamburger meals. I suppose most kids like plain burgers. But it was completely plain. Meat and a brioche roll. Dylan asked, "where's the lettuce and tomato?" I pointed him to the condiment bar; all they had there, though, was ketchup and mustard. So, we had to ask for lettuce and tomato on the side. I already mentioned what Jake ordered. I opted for a burger with blue cheese. Basic, but nice. The fries. Thick cut. Crispy. Yum. The boys' fries were plain. Jake and I split an order of Garlic Fries that weren't very garlicky. But they were delicious. Looking at my comments, I guess I have to say that they have good food, but the atmostphere and less than conventional ordering system completely detracted from the experience. Out of five stars, I'd give them two. I'm glad we tried 400 Degrees. But that was a one-timer. Have you been? What do you think? 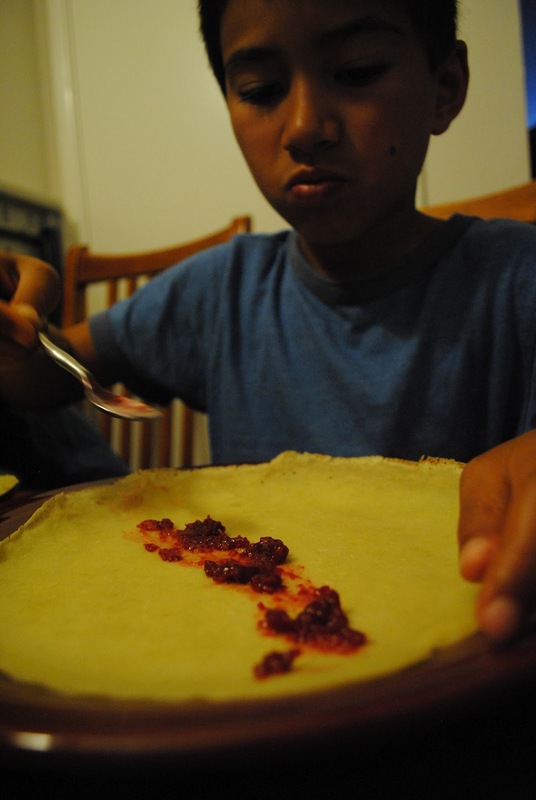 Riley asked for Danish crepes this morning and I had no jam in the house, but I did have two stalks of rhubarb and fresh raspberries. 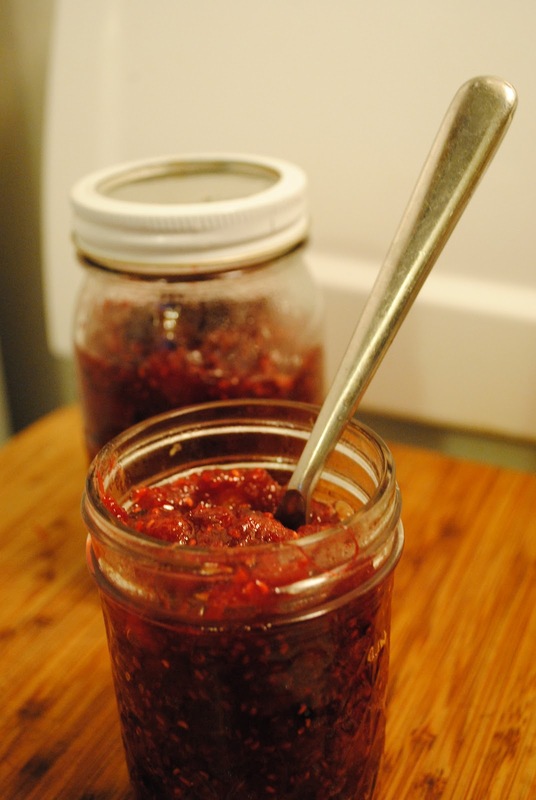 So, I made a quick jam (Rabarber-Hindbærsyltetøj): 1 C chopped rhubarb, 3 C fresh raspberries, 1/2 C water, 1 C organic granulated sugar. 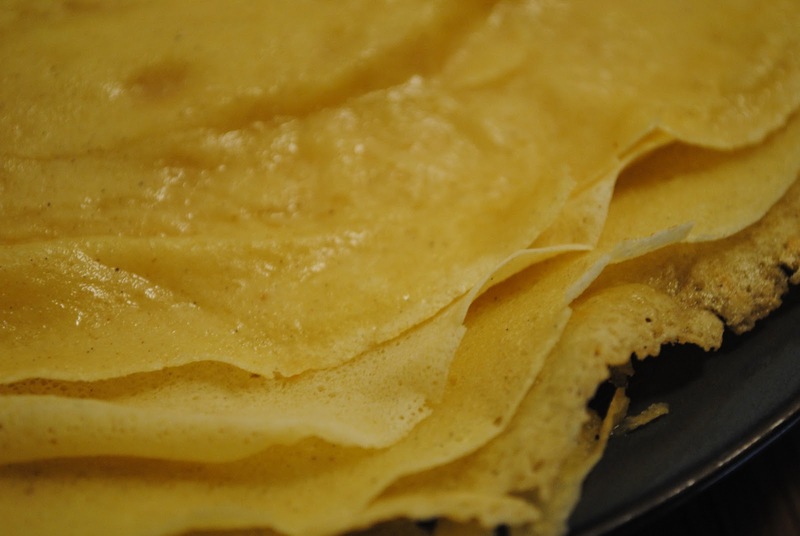 And I received the highest praise ever for my crepes. "Mommy," Riley announced, "these are just like Danya's and Ms. Ulla's." Dylan didn't say anything; he was too busy stuffing his face. Success! 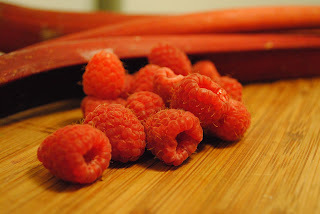 Add all ingredients to a bowl and mix well until all clumps are gone. Let rest for at least 20 minutes. Heat a large flat-bottom pan and rub the bottom with butter. Pour the batter in the middle of the pan and quickly make a tilting motion to distribute the batter all over the pan. The goal: have as thin a batter layer as possible. Cook until the pancake is a bit stiff and flip over, cooking for another minute The pancake should be lightly browned on both sides. Repeat till all the batter is used; I made 12 pancakes with the amount listed. 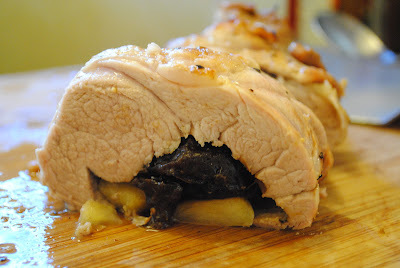 And to go with our Brunede Kartofler Dylan and I stuffed a pork tenderloin with apples and dried prunes. Cut tenderloins lengthwise almost in half. Sprinkle cut sides with salt and pepper. Place half each of the prunes and apple down center of one side of each tenderloin; cover with the other side. Lace with butcher's twine (100% cotton). Preheat the oven to 350 degrees. In a large, flat-bottomed pan, quickly brown all sides of the roast. 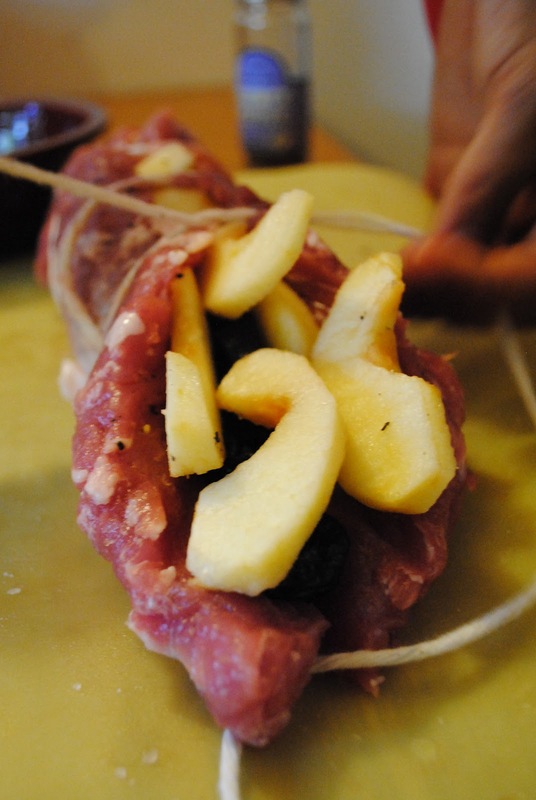 Then place the roll in a baking dish with the onions and any leftover apple slices. Season with more salt and pepper. Drizzle with olive oil. Roast for an hour - or until the meat is firm to the touch. In a small saucepan, whisk water and cornstarch together. 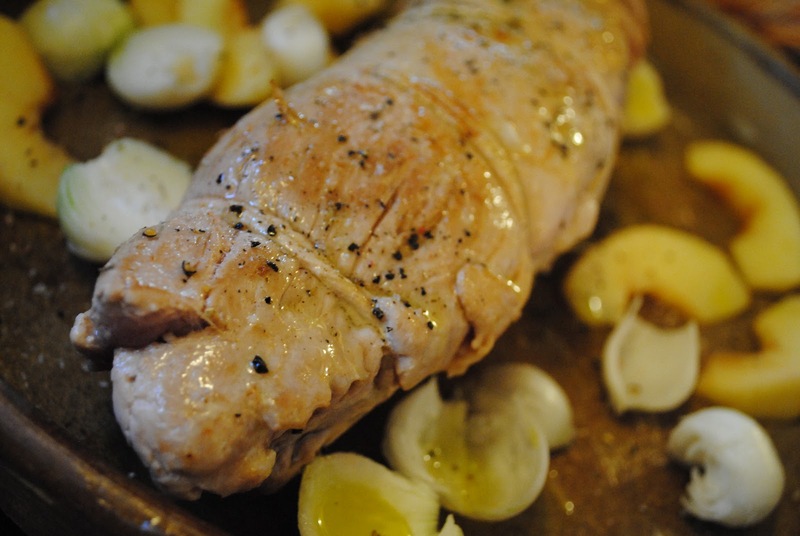 Gradually stir in pan drippings - with the onions and apples, as well - and heat to boiling, stirring contantly. 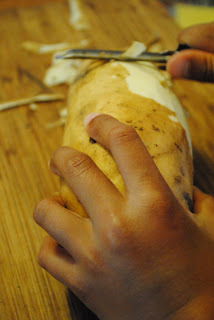 When it has thickened to desired consistency, remove from heat. 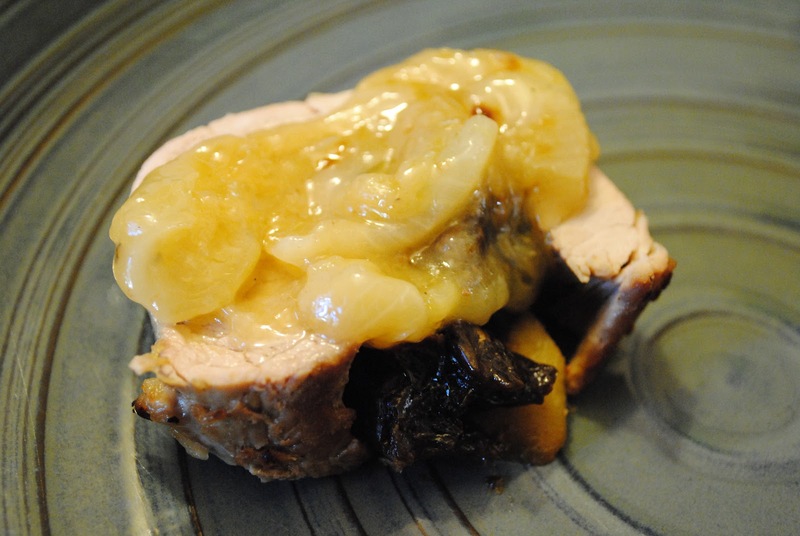 Cut pork into slices; serve with gravy.